Over the past few weeks I’ve been working with Nigel Ball to launch a new website dedicated to my fight for JUSTICE AND RIGHT. The site is now Up! Here’s the link so you can check it out …. Justice-And-Right.com includes regular Blog Posts updating our fight against Fraud and Treason. It also has a Forum where you can share your own insights and information with our in-house community. And there are several Groups you can join, to suit your specific interest. There is also some additional info on there not released on this blog – to give more background to our situation. So jump on line and have a poke around. And then help us beta-test the site by signing up, joining a group, starting a Forum discussion and checking out the site. Please let us know if there is anything we need to do to improve it. Oh, and please tell your friends about it too! What is Justice? When people say they want “justice”, what do they mean? Can you give a good definition for justice? I have been urged by friends to get right back to the basics of “justice” so people recognise what it is that I am fighting for. To do that I will probably have to write several articles that open the subject bit by bit. Ignoring the dictionaries, we can say that “justice” is when things are done right for all. Another way of putting it is that justice is when you do what your conscience tells you is right. And yet another way to put it is that the higher moral values are upheld in a situation, no matter who it upsets or disadvantages. But I think the best way to discover justice is not in definitions but in practical examples. English ideas of “justice” came from the Holy Bible, because England has had a thousand years of Christianity. English common law was developed from putting the Bible into practice. 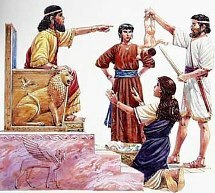 The kings and queens made promises (Imperial Acts) based on their responsibility before God. So, let’s have a look at a well known Biblical example of justice at work. Note a couple of things about this case right up front. These women had no-one to protect them. They did not have husbands. They were immoral women and in some cultures they could have no rights whatsoever. But here they are speaking directly to the King of the whole land. That’s justice! True justice gives the same rights to ALL, because all men are created equal. In some cultures there is an elite group which seeks to rule others as if those others are lesser people. That is happening in Australia and other advanced nations today. Way back in 1215 the English monarchy recognised and declared that everyone, even the King, is under the law. There is justice for all. Both of these women made the same claim, “It’s MY baby!” So, one of them was lying. But, being women who lived by immorality, they would have no qualms about lying. Yet they were not rejected. While the situation was challenging, King Solomon did not send them away empty. He determined to get to the bottom of the matter. In some places it’s just “too hard” to sort things out and so the courts resort to sharing out the blame or the costs or the loss. The idea is that some kind of equity or fairness is achieved. But that is not Justice. Justice gets right to the bottom of the matter and makes sure that the decision is as accurate as can be. Australian courts have tripped me up and denied me justice by imposing their various rules and protocol. But notice that King Solomon did not send these women away to fill out a form in triplicate, or to get representation from a duly qualified lawyer, or to present their case in a particular fashion. They had complete and ready access to the source of justice. The “Substance” of justice was not destroyed by the “form” of the “legal process” or the rules and regulations. In Australia today I find that courts use the legal process and their rules and regulations to take justice from ordinary Aussies. Justice is not a matter of text book exactness, but a matter of the heart. It is a ‘moral’ issue. God, who created us, is a moral Being and He looks at our hearts. King Solomon, wisely, exposed the heart of the women. He told the women he would cut the baby in half and give half to each one. He had no intention of doing so, but he used that suggestion to get the “hearts” of the women speaking. The two responses revealed which of the women had a mother’s heart for the child. The woman who believed she had been cheated proved to be the one who was the mother of the child. When the two women left Solomon one of them was exposed as a thief and a liar. I don’t think she was happy about that. True justice is not about making everyone happy, but doing what is RIGHT. The woman who stole and lied had no right to anything except shame, and that is what she received. The woman whose child was stolen received what was rightfully hers. He child was given back to her. She received justice and could raise her child in all the joy of her motherhood. Justice, then, is doing what is right, morally. It is not about everyone getting an equal share, but it is about everyone having the same rights before the courts. Everyone is entitled to an outcome that is morally right. It will be an outcome that sits right in your conscience and that pleases God, because evil people will not be rewarded. Today in Australia and other advanced nations we are not given that form of justice. People who do not use lawyers are disadvantaged. People who challenge the elite, ruling class which thinks it is superior to others, are blocked in the courts. The courts have become a place where people use power to take advantage of others. They entangle people with rules, fairness, pre-set judgments and other tricks to deny them justice. I spoke with a mum recently about how tough her hubby is on the kids. The dad sets a high standard that tests the hearts of the children. I pointed out to her that this is a very good thing for her son and daughter, even if it is not pleasant. I drew her attention to some wisdom from Solomon. Proverbs 4:23 warns us to carefully guard our heart because the “issues of life” come from it. There is a powerful truth packed into that short verse. I didn’t discover it, but someone pointed it out to me years ago. Simply put, what comes out of our heart determines what is a real “issue” in our life. It doesn’t just reveal the issue, it IS the issue. Our issues are not our external circumstances or what we go through, but what comes out of us in response. Issues are internal not external. And that’s Biblical. The issue is not the challenge, but the reaction from within. All of our issues are actually “heart issues”. To repeat myself, “issues are internal not external”. So, for example, consider a family where the father is a drunk. Each of the three kids has a drunken dad, but maybe only one of them will have an “issue” with that. Two of the kids may live normal lives, unaffected by the dad’s drinking. But the other child ends up with a chip on his shoulder, angry at the world because he had a lousy dad. Do you see then, that it is the REACTION that creates the issue? The drunken dad is not an issue or all three kids would have had the same issue. The drunken dad is a problem and a challenge, but doesn’t have to become an “issue”. If we blame others for our wrong attitudes we do not uncover the real “issues” of our life. Most people shift the blame onto the circumstances, like blaming a drunken father for their problems. But pressure and challenges bring our own junk to the surface, so we can get rid of our own issues. Challenges uncover our issues so we can resolve them. If we have fear we can deal with fear. If we have anger, resentment, unforgiveness, guilt or other issues inside us, then pressure brings them to the surface so we can recognise them and then find God’s grace to resolve them. Using the wisdom of Solomon, I was able to encourage the mum that her son and daughter will be much stronger and more reliable people in years to come, because their dad puts challenges on them that will make them strong. If she is a wise mum she will guide each child to deal with the “issues” that come up in their heart, so they work through things in readiness for the bigger challenges of the years ahead. Oh, and note that many adults today have missed out on that kind of constructive parenting. The idea of leaving a child to himself, to make his own choices and work through things his own way was the popular idea of parenting for the parents of Baby Boomers. So, many of today’s adults and youth are weakened by not having worked through their “issues” with the help of wise parenting skills. As I take my stand against Fraud and Treason it is interesting to see the “issues” people have with that. While most people are overwhelmingly supportive there are people who have responded irrationally and with venom. They are aroused and offended. Whatever it is that agitates them it is not what I am doing. Others applaud and support my stand against evil. So those who mutter, criticise or similarly react are revealing that they have “issues”. As they recognise and deal with those issues they will be better people for it. And, of course, as I do something I’ve never done before and face challenges I have never faced before that surfaces my issues as well. I have been able to pray through and resolve things that have come to the surface under the pressure of taking on evil. Someone said “Life wasn’t meant to be easy”, but it is meant to get better and better, if only we will find God’s grace for the “issues” in our life – which are in reality the issues of our own hearts.